Orange is definitely the new black! 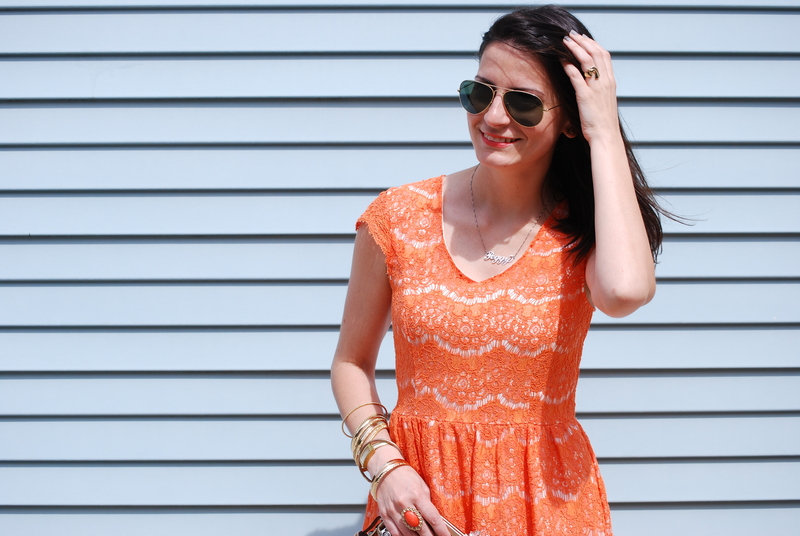 Not only am I talking about a series on Netflix, but orange is such a fun and vibrant color for summer. Don’t get me wrong, I will be saying black is the new orange once autumn rolls around don’t you worry. I wore this pretty little lace floral dress when I hosted a brunch for some lovely Chicago bloggers a couple of weeks ago at my place. It was a fun get together catching up with one another. After brunch it was off to a family gathering so I wore heels instead of my flats that I wore in my apartment. Have I told you how happy I am that it’s summer? Who knew some sun, bright colors and no responsibilities could automatically change my mood for the better.